TORONTO, September 14, 2016: Retail Council of Canada, on behalf of merchants across Canada, is encouraged by the Minister of Finance’s commitment today to review the credit card marketplace in Canada. 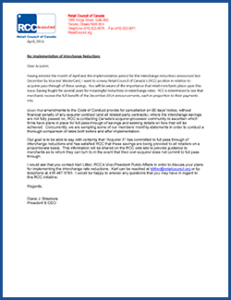 Retail Council of Canada has been the main advocate for a regulated solution to the credit card fee problem and welcomes this opportunity to shine a light on the multi-billion dollar costs imposed on all Canadians, including merchants, by Visa and MasterCard. Simply put, credit card interchange fees are far too high, with the credit card duopoly charging merchants in Canada – and ultimately Canadian consumers – five times what they charge in other markets for the same services. Retail Council of Canada has been the driving force and the most vocal advocate for regulating a cap on merchant credit card fees. Our retail members, from small independent main street merchants to mid-large global multinationals, pay fees that are punishing to their business and ultimately are passed on to consumers in the form of higher prices. As to the networks’ reports on their level of compliance with their “voluntary agreement” (MasterCard 1.5187%, Visa 1.5183%), Retail Council of Canada does not think that the variance of a few basis points from the Networks’ existing cap of 1.50% is particularly important. “Nobody gets a medal for clearing a two-foot bar”, said Diane J. Brisebois, President & CEO of the Retail Council of Canada. “The real issue is an absence of both competition and regulation that has allowed the credit card networks to overcharge merchants in Canada with fees five times what they should be”, Ms. Brisebois added. Retail Council of Canada is pleased to have been a driving force in today’s long-awaited announcement of enhancements to the Code of Conduct for the Credit and Debit Card Industry in Canada. 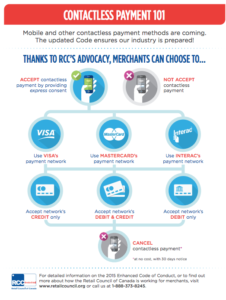 These updates to the Code deal with the arrival of smartphone/contactless payments, provide greater certainty that reductions in interchange rates will indeed be passed through to merchants, enable merchant choice in which payment forms to accept and also create a new path for dispute resolution in the payments industry. “With contactless cards already in market and smartphone payments the wave of the future, the modernization of the Code is vital and something that we have been pursuing on behalf of retailers in Canada,” said Diane J. Brisebois, President of Retail Council of Canada. “I am delighted that merchants will have full choice in which networks and payment methods to accept,” added Ms. Brisebois. Taken together with the network interchange reductions announced in December 2014, today’s announcement also helps to ensure that payment processors will pass on these reduced rates to merchants. While we see this as real progress, even with these reduced rates Canadian retailers are still paying some of the highest credit card fees in the world. For example, in the European Union, interchange rates are one-fifth of the average level paid by merchants in Canada. 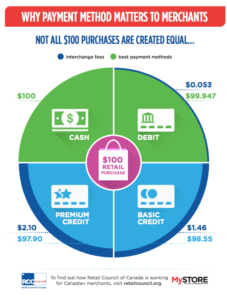 These costs are ultimately borne by all consumers whether they are paying with cash, debit or credit. RCC intends to continue to press for deeper cuts to bring interchange in line with the fees charged elsewhere. 1. An Enhanced Code of Conduct for Canada was released by the Federal Government April 13, 2015. What is in this version of the Code? 2. Are there changes to Code elements concerning other networks’ debit products? 3. What if I don’t want to accept contactless or only certain types of contactless payment? 4. I’d like to try mobile payments acceptance but can I change my mind if it is too costly? 5. My processor says that I need to accept contactless payment or at upgrade my terminals at least so I can take it in the future. Is that correct? 6. Won’t banks and networks simply position their higher-cost credit and network debit products at the front of the customer’s mobile wallet? 7. What if I want to accept “tap and pay” for small transactions but not mobile? 8. Will the Code do anything to lower interchange rates? 9. What should I do to ensure that I see the full savings from reductions in interchange rates? 10. What if it doesn’t look like my processor is passing on these savings? 11. I find my processor statements confusing. Is there anything being done to make them more intelligible? 12. What about fee increases from my processor? 13. My contract keeps being rolled-over . What if I just want to get out of my existing contract? 14. I have an issue with my service provider that we can’t seem to resolve. Where do I go for help? Q1. An Enhanced Code of Conduct for Canada was released by the Federal Government April 13, 2015. What is in this version of the Code? With the arrival of mobile payments of all types (commonly referred to as “contact-less), the Enhanced Code has been updated to include empowering merchant choice in whether to accept contactless from a given network or of a given type, particularly if there is a cost difference between types. The recent interchange reduction announcements (November 2014) required a mechanism to help ensure that acquirers pass the savings on to merchants. This is now part of the Enhanced Code. Retailer experience across Canada with the prior 2010 version of the Code has led to some changes in merchant statements (making them easier to read and understand), in notice requirements for fee changes and much more flexibility around contract cancellation. Finally, there is now a dispute-resolution mechanism when the Code is breached. Q2. Are there changes to Code elements concerning other networks’ debit products? A2. The current rule in element 6 prohibits competing debit applications on a physical debit card competing for the same transaction type, e.g., point-of-sale (POS). As well, under element 4, merchants are not obligated to accept other network debit if they accept that network’s credit products. This is a significant power for merchants. Combined, these rules have prevented other networks from forcing merchants to accept other network debit and riding Interac’s ubiquitous acceptance to gain entry into Canada’s debit market place. It has not protected Interac from debit competition. It has, though, a more level playing field for entry. In the mobile payments environment, it is easier to have competing payments on a phone than on a piece of plastic. The Enhanced Code addresses this issue and allows competing applications on a phone (e.g., tantamount to separate cards) but requires that payment applets for competing debit products be uploaded separately (and also separately from credit products). For the foreseeable future, the bulwark against other network debit entry into domestic transactions will be merchants’ refusal to accept other network debit. In that regard, merchants remain free to accept a network’s credit products and not its debit products, whether cards or contactless. Q3. What if I don’t want to accept contactless or only certain types of contactless payment? A3. The good news is that express consent is required from merchants to begin accepting new products or services. Merchants cannot inadvertently sign up for contactless payments. Merchants can also choose which network’s contactless to accept: Visa’s, MasterCard’s, Interac, or a combination or none. And, as per element 4, they do not have to accept debit contactless if they accept credit. For now, there is no price difference between payments from mobile devices and those from other types of contactless, e.g., “tap and pay” cards. If mobile does become more expensive then merchants will be able to deactivate mobile payments while continuing to accept “tap and pay”. Q4. I’d like to try mobile payments acceptance but can I change my mind if it is too costly? A4. Yes! Merchants can choose to accept any network’s mobile offerings and can deactivate them on 30-days’ notice, without having to deactivate any other form of payment. As a retailer though the important thing for merchants across Canada, of all sizes, to consider very carefully is that if your customers get used to making contactless payments, you may find it hard to deactivate them later. You may or may not see growth in your customer base, but may find yourself dealing with higher costs on the same sales base. Q5. My processor says that I need to accept contactless payment or at upgrade my terminals at least so I can take it in the future. Is that correct? A5. No, that is not correct. Under the Enhanced Code, merchants cannot be required to accept contactless payments or to upgrade terminals to enable contactless. It is entirely your decision and you have three choices: (a) do not accept contactless payments; (b) accept all networks’ contactless products; (c) accept a single network’s contactless products. You can revisit your decision without financial penalty. Q6. Won’t banks and networks simply position their higher-cost credit and network debit products at the front of the customer’s mobile wallet? A6. Maybe. There is certainly a risk that they will try to do so. The Enhanced Code attempts to address this by trying to treat a mobile wallet like a physical wallet. Each payment “applet” will need to be uploaded separately, rather than the wallet being pre-configured by a bank. And those applets will have to be equally prominent and accessible in the wallet. Default preferences for mobile payment methods may only be set by the consumer and the consumer will be able to move back and forth easily and quickly between payment choices while at point-of-sale. But there is no question that banks and the networks will try to persuade consumers to select expensive premium payment methods as a marketing tactic for their own business strategies, and they will even be able to do that by messaging the device that contains the mobile wallet. Retail Council of Canada has already seen some evidence from the US that mobile payments are producing a shift from debit to credit and that should be an important consideration for you when thinking about whether to accept contactless payments. As a merchant, you must ask yourself whether accepting mobile payment will truly increase or protect sales or are you just encouraging customers who would shop anyways to switch from low cost cash and debit payments to higher cost credit. Q7. What if I want to accept “tap and pay” for small transactions but not mobile? A7. With the new Enhanced Code they are priced the same, so you aren’t able to choose between different types of contactless (though you can choose between networks). But if mobile payments do become more expensive than other forms of contactless, you will be able to de-select mobile while maintaining in place all other provisions of your existing contract. These provisions could prove to be of real importance as/if major handset device and software manufacturers and telecommunications companies seek to enter the payments industry. They will be additional “mouths to feed” (i.e. incremental costs) but the Enhanced Code prevents theses additional costs being passed on to you without your agreement. Q8. Will the Code do anything to lower interchange rates? A8. The Enhanced Code doesn’t deal with interchange rates as such but does contain some mechanisms to help ensure that the savings announced by the card networks in December 2014 do get passed on to merchants by their processors when these reductions take effect in April 2015. First, the entire Enhanced Code will be incorporated by Visa and MasterCard into network contracts, rules, and regulations applicable to their issuers (banks), acquirers (processors) and other downstream service providers. Second, the networks are required to ensure Enhanced Code compliance by their participants. Third, in the event that an acquirer does not pass through the full savings from a reduction in the networks’ posted interchange rates, a merchant has the right to provide 90 days’ notice to exit its contract without penalty. This right includes relief from financial penalties on all related service contracts, including those for terminal leases or third-party processing, brokered by the acquirer or any of its agents. 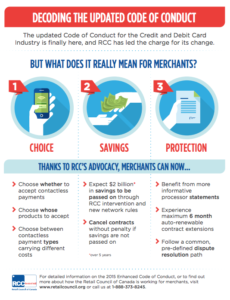 Although changing processors is obviously disruptive for merchants, RCC believes that the combination of network pressure on the processors and the potential for merchants to walk away from their contracts should be sufficient to ensure that most acquirers pass on the full savings. Q9. What should I do to ensure that I see the full savings from reductions in interchange rates? 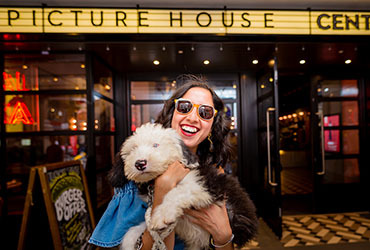 A9. These changes will be implemented during the month of April 2015, so it is important that every merchant contact its acquirer and receive a full explanation as to how that acquirer intends to pass on the interchange savings. If you have any questions you also reach out to members services at Retail Council of Canada (whether you are a RCC member retailer or not) at http://www.retailcouncil.org/about/contact or call us toll-free at 1.888.373.8245. For those with interchange-plus contracts, the exercise will be an easy one. Similarly, those who pay a merchant discount rate (MDR) will be able to see if the percentage reductions in interchange are matched by corresponding percentage reductions in their MDR. Those merchants with a form of blended rate will need a detailed explanation from their acquirers. Q10. What if it doesn’t look like my processor is passing on these savings? A10. Each merchant’s relationship with its acquirer (processor) is will differ from another’s, so you will need to make an assessment as to whether it makes sense to change your processor. In making this decision, you should be aware that for most merchants, savings will average around 8% of current interchange levels. RCC suggests that you begin by gaining a full understanding of whether the savings are being passed on to you and if not, why not. In the event that a shortfall is confirmed by your calculations or by the processor directly, you do have the right to provide the processor with 90 days’ notice to exit your contract without penalty. You will also be relieved of the obligation to pay financial penalties on related service contracts, including those for terminal leases or third-party processing, brokered by the acquirer or any of its agents. The Financial Consumer Agency of Canada (FCAC) is tasked with ensuring compliance with the Enhanced Code and RCC will work with the FCAC on this issue as far as notice requirements are concerned. Pending an outcome from those discussions, you will want to look to your existing contract for direction as to the form of notice required and to whom that notice must be delivered. Q11. I find my processor statements confusing. Is there anything being done to make them more intelligible? A11. Yes! The Enhanced Code does contain provisions aimed at making processor statements and agreements clearer for the reader. All merchant-acquirer agreements will include a cover page containing an information summary box that provides key elements of the contract in a consolidated fashion and a fee disclosure box. Q12. What about fee increases from my processor? A12. The primary goal of the Enhanced Code is to provide merchants with cost certainty over the life of a contract with an acquirer. Code 1.0 already requires 90 days’ notice of any fee increase and in the event of a fee increase, permits the merchant to cancel its processor contract (and all associated contracts) without financial penalty. Q13. My contract keeps being rolled-over . What if I just want to get out of my existing contract? A13. Merchants may provide notice of non-renewal at any point up to 90 days before the expiry of a processing contract. To address the problem that some merchants have experienced with so-called “evergreen” contracts, i.e., those that renew for a full term in the absence of a properly-timed cancellation notice, the Enhanced Code provides that fixed-term contracts will not be automatically renewed for the initial term, but convert to automatically renewable contract extensions of no longer than six months. The automatic short-term renewals ensure that the merchant will not inadvertently end up with a break in payments processing service. Merchants are of course free to sign a new, long-term contract if they so wish. Q14. I have an issue with my service provider that we can’t seem to resolve. Where do I go for help? A14. The Enhanced Code lays out a dispute-resolution path. If a merchant believes that a service provider’s conduct is contrary to the Enhanced Code, the merchant may report the issue to its acquirer. Service providers include acquirers, processors, independent sales organizations (ISOs), and referral agents. The acquirer will review the issue with the merchant, undertake an investigation, and respond within ninety days. If a satisfactory resolution not achieved, the merchant may submit the complaint to the payment card networks. Networks will investigate any complaints received from the acquirer or directly from a merchant and will work to find an appropriate resolution, and communicate the outcome of the investigation directly to the merchant within forty-five days of receiving the complaint. Nothing in the above process restricts the merchant from directly filing complaints with the FCAC, or a payment card network, to investigate non-compliance with the Code. Enhancements to the Code of Conduct for the Credit Card and Debit Card Industry in Canada (“the Code”) have now been released. The Retail Council of Canada was a driving force in the creation of the original version of the Code in 2010 (“Code 1.0”), and has worked hard since that time on these important updates as a vocal member in the Finance Canada Payments Consultative Committee. CHOICE – New rules for contactless payment, particularly mobile payment, allowing merchants to choose whether to accept contactless payment, whose products to accept, and to choose between different payment types that may carry different costs. PROTECTION – Greater clarity in statements, and better rules for contract termination, as well as a new process to resolve any disputes that might arise. Code 2.0 requires separate payment applications (“applets”) for each debit and each credit payment option within a mobile wallet. These applets must be uploaded individually and appear separately. 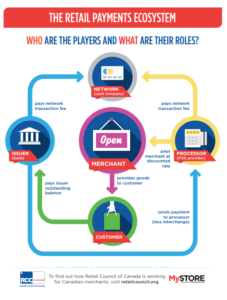 The choice of whether to accept network debit or credit products remains with the merchant. Code 2.0 also requires that all payment applets in a mobile wallet or device must be clearly identifiable and equally prominent, ensuring that where Interac is present in a mobile wallet, it is not crowded out by larger or flashier network credit or debit offerings. Finally, the Code ensures that a customer using a mobile wallet is not “locked-in”, can set his or her own payment preferences, and is able to move easily between payment options at point-of-sale. Code 2.0 ensures that a merchant who chooses to accept a network’s credit payments from a mobile device is not required to accept debit payments from that network and vice versa. Merchants cannot be required to accept contactless payments at point-of-sale or to upgrade terminals to enable contactless payment, and if a merchant does choose to accept contactless payment, the merchant may, with thirty days’ notice, cancel without financial penalty. The Code also specifies that “negative option” acceptance is not allowed. As a result, even if the merchant’s POS terminal is physically able to accept contactless payment, it does not mean the merchant must accept contactless payment; merchants must give their express consent. 1. Requiring networks to incorporate the Code into all of their existing and future contracts, rules, and regulations with their participants, including issuers (banks), acquirers (processors), etc. 3.In the event that an acquirer does not pass through the full savings from a reduction in interchange rates, a merchant has the right, with 90-days notice, to cancel their contract without penalty. Although changing processors is obviously disruptive for merchants, RCC believes that the combination of network pressure on acquirers and the potential for merchants to walk away from their contracts should be sufficient to ensure that most acquirers pass on the full savings. The remaining changes made by Code 2.0 deal with clearer statements, earlier notice of changes and the establishment of a dispute-settlement route. The primary goal is to provide merchants with cost certainty over the life of a contract with an acquirer. Code 2.0 expands the 90-day notice requirement of fee changes to include reductions in interchange rates and empowers merchants to cancel their processor contract if the savings are not fully passed on. Code 2.0 also provides that fixed-term contracts will not be automatically renewed for the initial term length, but will instead convert to automatically renewable contract extensions of no longer than six months. Code 2.0 lays out a dispute-resolution path. If a merchant believes that a service provider’s conduct is contrary to the Code, the merchant may report the issue to its acquirer. Service providers include acquirers, processors, independent sales organizations, and referral agents. The acquirer will review the issue with the merchant, undertake an investigation, and respond within ninety days. If a satisfactory resolution is not achieved, the merchant may submit the complaint to the payment card networks, who will work to find an appropriate resolution, and communicate the outcome of the investigation directly to the merchant within forty-five days of receiving the complaint. And, should the merchant choose, they remain free to directly file a complaint with the Financial Consumer Agency of Canada, or a payment card network, to investigate non-compliance with the Code. TO LEARN MORE ABOUT CREDIT CARD INTERCHANGE RATES, CLICK HERE.